Well, Kai isn’t driving yet, or even pedaling. 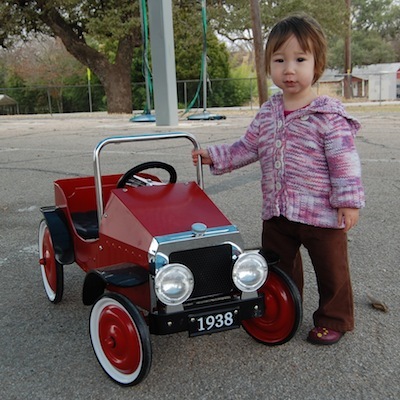 She does enjoy getting in and out of vehicles – like other kids’ cars, cardboard boxes and her dump truck. We had a really great cardboard box (just the right size!) that she used as her boat for “Row Row Row Your Boat” but we left it at a birthday party, so now we’re using a smaller sleeker box as her boat. It’s not as fun since she can’t grab onto the sides and rock the boat herself, but it’s definitely easier for her to get in and out of. « A budding obsession with dental hygiene? Go Kai go! She is so cute! Kai you don’t have your boat anymore? Never mind there are lots of boxes that can be made into all kinds of things. What a great idea. I will be making a boat for Bee this weekend.